Depth: Surface sow and firm lightly; requires light to germinate. Starting Indoors: Recommended. Sow 8-10 weeks before last frost. Keep at 65-68°F. Starting Outdoors: Zones 8+, direct sow after last frost. A must for wildflower gardens and naturalized areas, but also a nice addition to more formal settings. May overwinter as a perennial in zones 5-8, but most often grown as an annual. Be sure to keep evenly moist in zones 8+. Soil pH: Prefers acidic to neutral but tolerates a wide pH range. Fertilizer: Prior to planting, mix in about 2” of compost or some organic granular fertilizer. Plant: Lance-shaped leaves are rough and hairy, 3-6" long. Seeds: Flowers produce achenes. May self-sow. When to Cut: Just as flowers start to open. 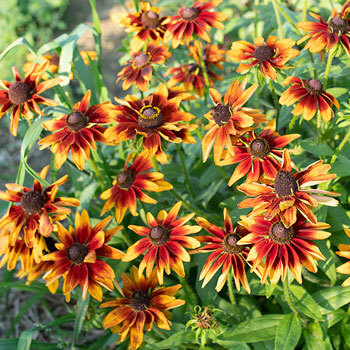 Rudbeckia hirta is sometimes referred to as gloriosa daisy.